Fam20 structure is shown as ribbons. The N- and C-lobes are shown in magenta and teal, respectively. The alpha helix (PKA aC equivalent) is highlighted in orange. The N-terminal segment, the insertion domain, and the C-terminal extension are in white. In eukaryotes, most phosphoproteins reside within the nucleus and cytosol. However, extracellular proteins, such as the milk protein casein, are also phosphorylated by “orphan” kinases located within the secretory pathway. In fact, the first evidence alluding to the existence of protein kinases dates back to the nineteenth century when Olof Hammarsten detected phosphorous in casein. In hindsight, this was the first indication for the existence of protein kinases that were ultimately discovered and named nearly one century later using casein as a model substrate. The proteins known as "casein kinases" are in fact cytosolic and nuclear proteins and do not mediate physiological phosphorylation of casein because they are spatially restricted from the secretory apparatus and the extracellular space. 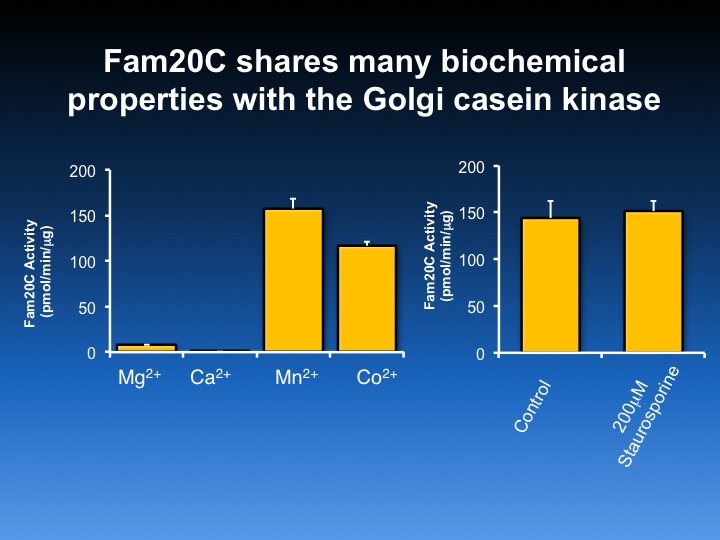 We have discovered that Fam20C phosphorylates the caseins and several secreted proteins implicated in biomineralization, including the small integrin binding ligand, N-linked glycoproteins (SIBLINGs). 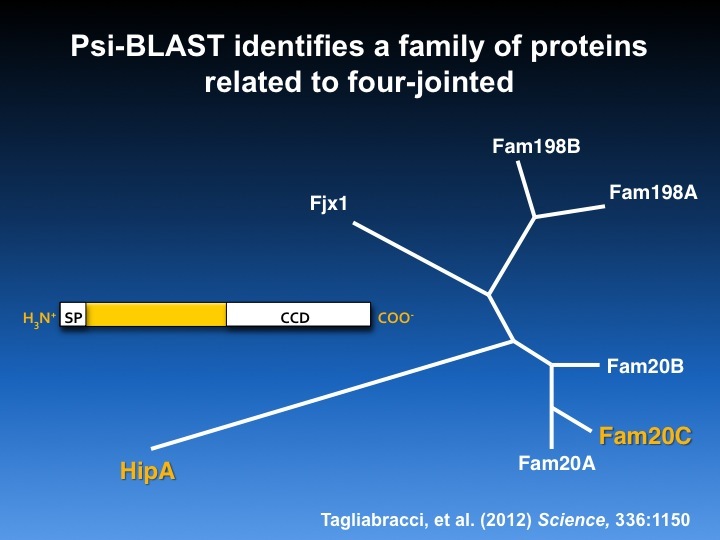 Consequently, mutations in Fam20C cause a devastating osteosclerotic bone dysplasia in humans known as Raine syndrome.